I first learnt about ‘the omelette with no eggs’ when we were vacationing in Matheran last year. The resort that we were staying at served this for breakfast one morning, and we loved it. ‘This is tomato omelette. No eggs, sir. Don’t worry, madam,’ the resort staff reassured us after we quizzed them on the recipe, having heard about the dish for the first time ever. It made for a hearty and delicious breakfast, and the OH and I licked our plates clean. A little bit of ‘googling’ showed us that tomato omelettes, also called ‘veg. omelettes’, are quite a popular breakfast dish in Maharashtra. I had completely forgotten about this dish till today, when I accidentally read about it on the Internet. It stirred up a longing for the quaint Matheran, for days of lounging around and doing nothing, some quiet time with the OH, and for the lovely food that we gobbled up while on our vacation. We are not in a position to satisfy my wanderlust immediately, but I decided that I could satisfy my craving for the food that we ate in Matheran, though. I made tomato omelette for lunch today, and it completely threw the OH off – it turned out exactly like the one that we had at Matheran. 1. Mix all the ingredients for the batter together, and run it through the mixer briefly. Place the mixture in a large mixing bowl, and add the required amount of water to bring the batter to the required consistency. 3. Heat a dosa tawa, and pour a ladleful of the batter on it. Spread the batter using the ladle (like a dosa), and add a bit of oil around the edge. 4. Let it cook for about a minute and turn it over. Let it cook on the other side as well. That’s about it! Your tomato omelette is ready to be served. It doesn’t really need any accompanying dish, but it can be served with tomato ketchup. Simple and fun, isn’t it? Have you ever had this dish? I was curious about the captions. Ofcourse, will do it tomorrow. (Tuesday). eggless omellettes? and as simple as omelletes.. thats a defnite try.. I tried this one ! 🙂 On friday for dinner and loved the taste. My only improvement needs to be in making the batter a bit thicker coz’ it got runny and I ended up adding more besan and all that and it wasn’t cooking well. So I made really little ones but liked the taste 🙂 I will do a weekend food chronicle post this week and will share the snap. Yay ! I’ll let you knwo when I post ) They don’t look as gorgeous as yours, ofcourse ! Oh, I am so glad you could try this one out, and it turned out well. 🙂 So happy you liked it. Maybe you could add a bit more rice flour and a little less water the next time? It would help in making the batter thicker, I guess, and easier to spread out on the pan. I will have to try this…thanks for sharing…looks Yummy! That looks yum! Never heard of tomatoe omlettes before, worth giving a try. Wow! This looks delicious. I am not much of an “egg eater” but know that a healthy omelet would be a nutritious little meal. I will have to try this! I had never heard of this dish before I went to Matheran. Do you use the same proceedure? I actually thought yours looked like adai until I read the recipe. Sounds very simple. My dinner tomo it will be :)) thankee ! 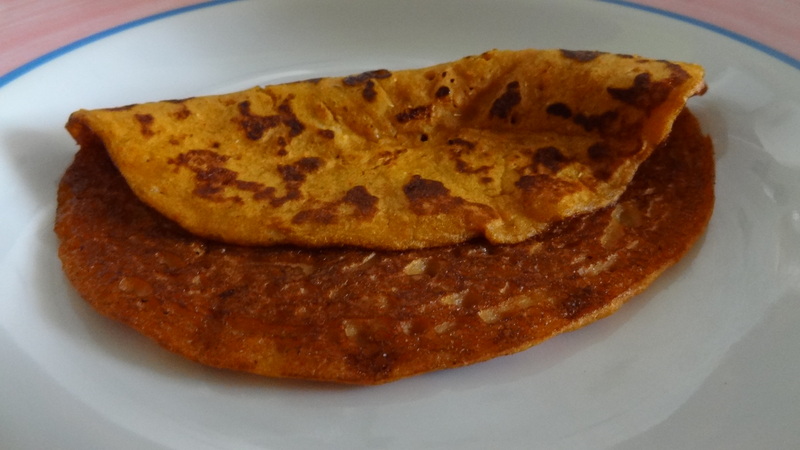 Yes, it does look like adai, but tastes very different. LOL @ ‘create the besan’. Your version would taste like adai, maybe? What we do is instead of gram flour, we soak the gram overnight, then grind it coarsely and mix the ingredients. Is it? I didn’t read about soaking gram anywhere. 😦 All the recipes I read used only besan. Which gram do you use for this? The small, red chana or the Kabuli chana? Do try this out, and I would love to know how it turned out. Next Next post: Some OH-isms….